As one of the world’s fastest bowlers, who has smashed multiple cricket records, Brett’s new target is 360 million people – and raising awareness about hearing loss. 360 million is the estimated number of people worldwide suffering from a disabling hearing loss. Many, however, are not aware of the effects it can have on them or what treatments are available. Speaking in London at Lords, prior to the start of The Ashes, Brett said, “Hearing loss is a huge global public health issue. I can’t imagine cricket without sound – on the field not hearing the appeals and the crowd, off the field not hearing team mates, or at home not hearing family. I can’t imagine it. “A cochlear implant can change all of that. I’ve seen it happen. The implant takes a person from silence to sound. It is a wonderful, life changing moment. Brett said his association with Cochlear began when he was filming the soon to be released movie, unIndian. 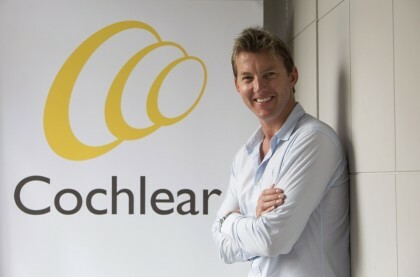 Cochlear CEO, Dr Chris Roberts, said, “We are delighted to have one of the true greats of sport working with Cochlear. Sport is a universal language and cricket is one of the most communicated languages in the world. “While 114 million people watched this year’s Superbowl, making it the most watched television program in US history, approximately 1 billion people watched the Cricket World Cup Match between India and Pakistan, broadcast from Adelaide. That is truly astonishing. Cochlear is the global leader in implantable hearing solutions. The company has a global workforce of 2,700 people and its products include hearing systems for cochlear, bone conduction and acoustic implants.